You are here: Home / Editorial / As per the ENCA News Anchor, DID Mr Gordhan really say this? My faith in the media and them doing the basics of their job has been severely tested of late. I have observed how time and again media have failed to apply the basic principle of any story: Answer the 5W’s and 1H: Who, What, When, Where, Why and How. “Interesting,” I thought and popped on over to Google to answer the 5W’s by simply plugging in the QUOTE (in quotes) to see Who the US journalist was, What question was asked, When it occurred, Where it occurred and hopefully Why. 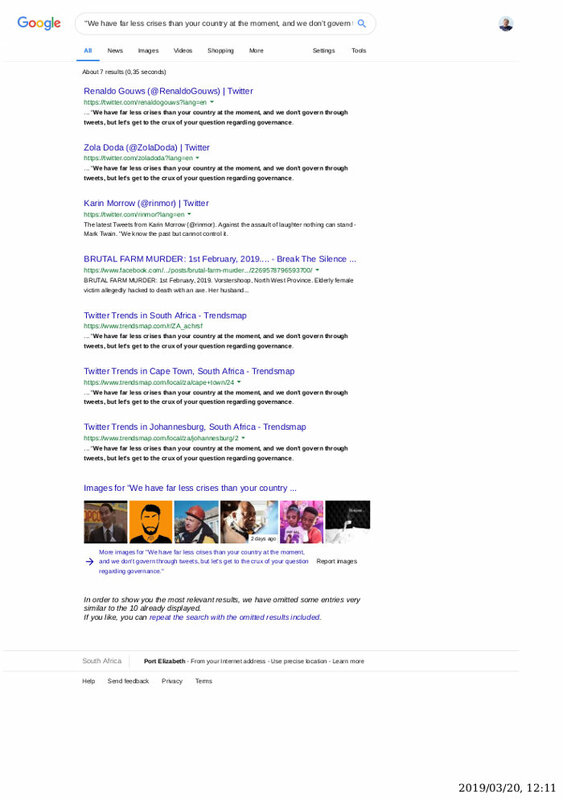 I cannot find those words, supposedly said by Pravin Gordhan ANYWHERE in the Google results (except for people who have blindly retweeted Michelle’s tweet). I find that grossly unfair and unprofessional of a ‘professional’. Fact Checking Alert: The US Journalist is NOT named, the publication is NOT named, a search on Google for the QUOTED words does NOT show that the ‘US Journalist’ NOR any publication has published those words – What happened to basic fact checking or NOT publicising anything until it can be verified? Previous: Rand Plummet – Should Maimane have asked Ramaphosa THAT question?